Through the annual public presentation of speakers, artists and performers, the VSI invites scholars working in hybrid formats to model innovation to the university and its surrounding communities. 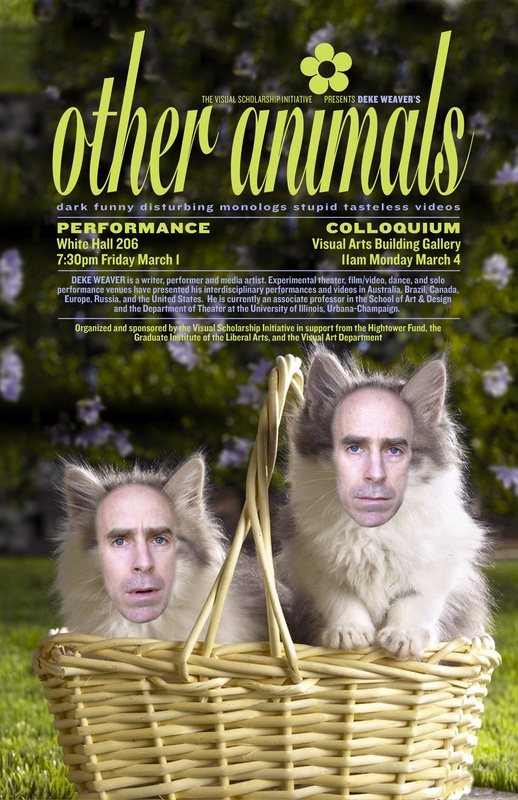 With help from the Hightower Fund grant, co-sponsored by the Graduate Institute of the Liberal Arts and the Visual Arts department, and with the Goat Farm Arts Center’s Arts Investment Package, VSI presents Deke Weaver’s Other Animals. Other Animals bubbles with the gothic (a Frustrated Man tortured by wolfish yearnings), the tragic (a tale of disaster: a park ranger presents an aviary of hawks and eagles to an elementary school assembly), and the mythic (a lean hunting parable of a bottomless appetite and the beast within) – a solo performance of dark, funny monologues and stupid tasteless videos built to get under your hide. Allan Sekula’s lecture Critical Realism in a Time of Lies is co-sponsored by Georgia Tech, College of Architecture and Visual Arts, American Studies, the Graduate Institute of Liberal Arts and the Visual Scholarship Initiative at Emory University and the Hightower Fund. The screening of The Forgotten Space is sponsored by W Atlanta-Downtown. 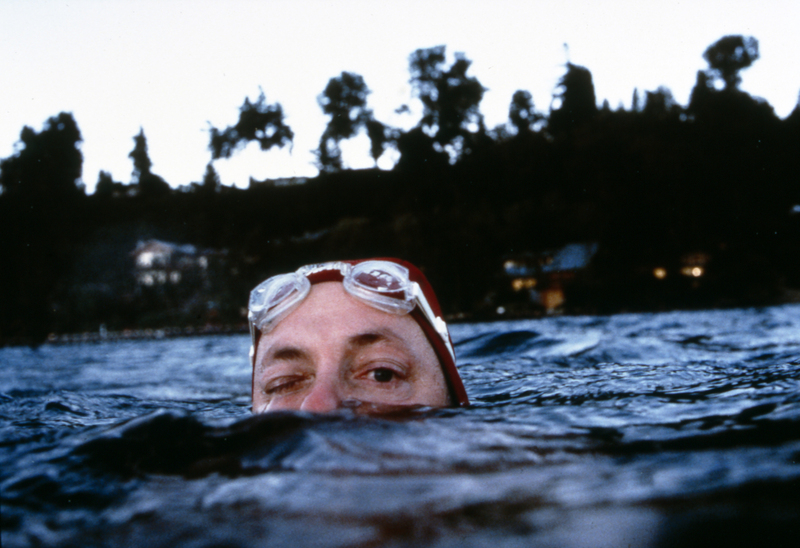 In his artist’s talk, Allan Sekula will provide a close look at a few of the works he made between 1974 and 2010. He will discuss the ways in which they both explore the unstable position of photography within the art system and acknowledge, if not assert, the “worldliness” of the image. Born in Erie, Pennsylvania in 1951 and based in Los Angeles, Allan Sekula is a photographer, writer-critic, and filmmaker. Since the early 1970s, his works with photographic sequences, written texts, slide shows, and sound recordings have traveled a path close to cinema. At times, they refer to specific films. In other instances, such as his 1973 work Aerospace Folktales, they operate like a “disassembled movie” while resisting the “dictatorship of the projector.” Yet, with the exception of a few video works from the early 70s and early 80s, he has stayed away from the moving image. This changed in 2001, with Tsukiji, titled after the Tokyo fish market: this is in fact the first work that Sekula was willing to call a film. His subsequent films include Short Film for Laos, 2006, and Lottery of the Sea, 2006. His most recent film, The Forgotten Space, has been screened in over 30 festivals worldwide since its premiere at the Venice Film Festival in 2010, where it won a special jury prize. Sekula’s books include Photography against the Grain, 1984; Fish Story, 1995; Geography Lesson: Canadian Notes, 1996; Dismal Science, 1999; Performance under Working Conditions, 2003; TITANIC’s wake, 2003; and Polonia and Other Fables, 2009. These works range thematically from critical investigations of the history of photography to studies of family life in the grip of the military-industrial complex, branching out into explorations of myths of national identity. In addition, his longstanding interest in questions of sovereignty led to a number of widely exhibited works on the global maritime economy, including The Forgotten Space. His extended photographic works on this subject were included in Documenta 11, 2002, and Documenta 12, 2007, in Kassel, Germany. Allan Sekula has taught in the Cinema Studies Program at New York University, in the now-defunct Department of Photography and Cinema at Ohio State University, and since 1985, in the Program in Photography and Media at the California Institute of the Arts. The intellectual seriousness of ethnographic film has long been contested. The genre is often understood to be part of a popularizing endeavor that is illustrative not generative, descriptive not analytical. Drawing on her current project, Anna Grimshaw explores the kind of anthropology that she seeks to pursue through the medium of film. What sort of scholarly inquiry is constituted by the use of particular shooting and editing techniques? Professor Anna Grimshaw (ILA) is an anthropologist and filmmaker. 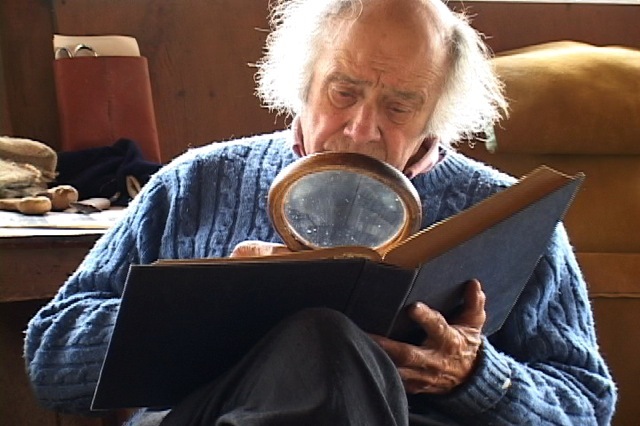 She is currently completing a cycle of four films that explores the life of William Coperthwaite, who has lived in the Maine woods for over fifty years. The ILA Colloquium is an open forum for intellectual exchange among faculty and graduate students. Brief presentations will be followed by open discussion. Light refreshments with be provided. All are welcome! (Parking and shuttle service available from the Peavine Parking Deck). childhood and his renewed bond with his dad. Read the New York Times review of ECHOLALIA. Thursday October 7, 7 PM. The Hysterical Alphabet is an interdisciplinary, multi-media performance by artist collective Theater Oobleck based on the book written by Terri Kapsalis, illustrated by Gina Litherland, published by White Walls, and distributed by the University of Chicago Press. The work is based on research on the cultural history of hysteria, an under-recognized four thousand-year history that deeply inflects our contemporary ideas about gender and illness. Drawn from primary medical writings from ancient Egypt to the present, The Hysterical Alphabet is an abecedary offering a condensed history of hysteria with levity, playfulness, and critical insight. Hysterical Alphabet was a collaboration among ILA, Visual Arts, Theater, Music, Women’s Studies, Film Studies, Psychoanalytic Studies and the Emory College Center for Creativity and Arts and was also supported by a grant from the Hightower Fund.